17.5: at 200x and 140x using an OIII filter appears faint, moderately large, ~50" diameter, round. Can hold continuously with averted vision and visible with direct vision. Did not look unfiltered for the mag 15 central star. 13: at 79x with OIII filter appears extremely faint, moderately large, 1.0' diameter, almost round, can barely hold steadily. Just visible using a UHC visible although appears near the visual threshold. 17.5" (7/22/01): moderately bright, fairly small, perfectly circular. Easily picked by scanning region at 100x just 3.5' NE of mag 8.9 SAO 47978. Appears unevenly lit at 280x, ~30" diameter with slightly enhanced regions along the rim. A very faint star is off the NE edge. 17.5: at 220x without filter appears fairly faint, round, fairly small. At 105x using an OIII filter the planetary is bright and compact with crisp round edges. 17.5: One of the relatively bright Abell planetaries situated in Sagittarius. The oval glow (about 1.5' major axis) was noticeably elongated NW to SE with a mag 13.5 star placed at the SE tip. 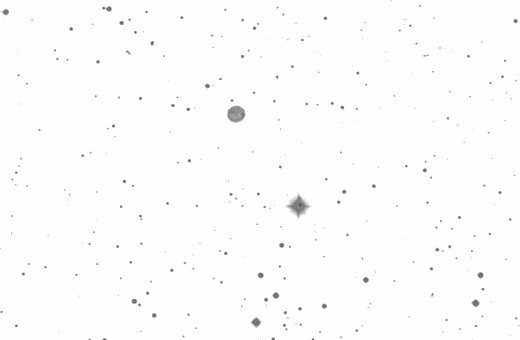 The surface brightness seems to fade into the background as you move towards the NW end. Again this planetary was visible without a filter at 140x, although the view was more pleasing with an OIII filter. 13: at 79x with OIII filter; fairly faint, large, estimate 1.2'x0.4'. Can just hold steadily with direct and easy with averted vision. Also visible with Daystar 300 although very difficult with this filter. Noticeably elongated NW-SE otherwise no structure resolved and the planetary has an even surface brightness. Bracketed by two mag 13.5 stars close NW and SE. 17.5" (8/16/01): picked up at 220x without filter and an excellent view at 280x. The PN appears slightly elongated NW-SE, ~40"x35" with a clearly irregular surface brightness. 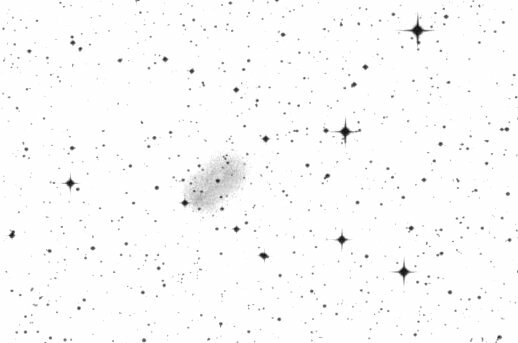 The galaxy shining through the north side is visible as a brighter "knot", but with extended viewing this enhancement is elongated WNW-ESE, perhaps 15"x8". A faint star is ~30" off the SW side with a brighter star ~45" off the SE edge. Modest contrast gain with UHC filter although the brightening along the N side was more difficult to detect. 17.5 (8/12/96): picked up without problem at 100x using an OIII filter as a 40" disc with a brighter streak running along the N side. Visible without filter but the streak and disc are dimmer to view. Seen well without filter at 220x where the disc is a bit more prominent but still brighter along the N side. 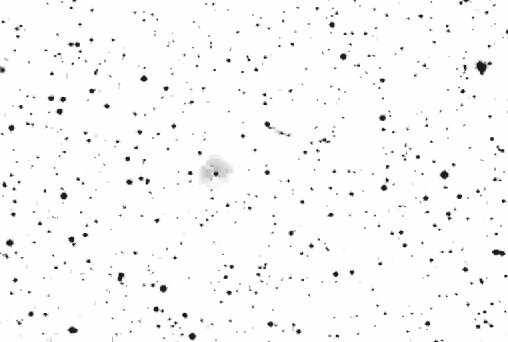 Based on this observation that the streak is quite evident using an OIII filter at low power, it does not respond as an anonymous galaxy, but there is strong evidence it is a distant galaxy. 17.5 (7/31/92): easily visible at 100x using an OIII filter and can hold steadily with direct vision. 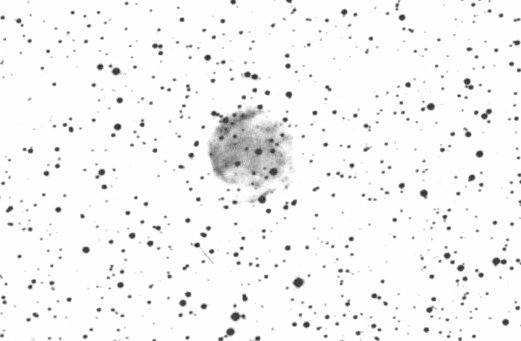 Fairly faint, fairly small, almost round, 30" diameter, estimate V = 14.0-14.3. Visible without filter using averted vision. At 220x viewed without filter; faint, fairly small, appears to be brighter along the N side, edges not as crisp using this higher power. 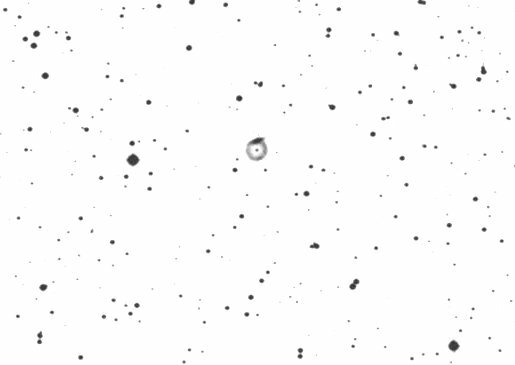 The brightening detected along the N edge of the rim at 220x is assumed to be a very faint anonymous galaxy shining through the planetary. 17.5: at 83x and OIII filter; extremely faint, moderately large, roundish, very low surface brightness but definite with averted. A pair of stars is at the S edge. The planetary may encompass this pair and a second pair is further E. Located in a rich star field. 17.5" (7/18/01): easily picked up at 64x and OIII filter as a fairly faint, moderately large, round glow. Unusual setting with a mag 8 star just off the WSW edge and two 11th mag and a 13th mag star off the E and SE side. At 140x and a UHC filter the disc is fairly large and slightly elongated ~E-W, ~2' diameter. Without the filter a couple of fainter stars are superimposed on the disc. 17.5: at 100x and OIII filter; fairly faint, large, 2' diameter, irregular shape without crisp edges. Striking location as mag 8.1 SAO 106544 is just off the the WSW edge 1.8' from the center! Mag 8.9 SAO 106544 lies 3.8' NNE and two mag 11 stars and a mag 13 star are just off the E and SE edges. A mag 13 star superimposed in the center is probably not the central star. Also viewed unfiltered at 220x although best view is at low power. 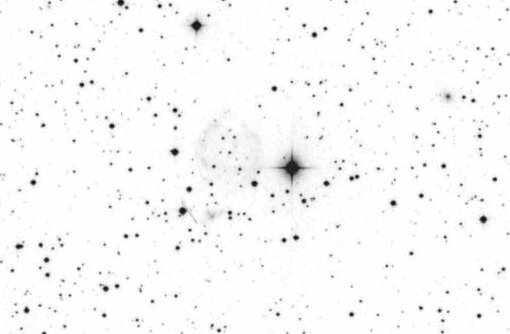 13: faint, large, very diffuse, several faint stars superimposed and a mag 8 star is just off the W end! A mag 9 star is 4' N and three stars are off the E edge.